This mission not only forms the basis for our sustainable business operations, but also for our consultancy work, in which sustainability plays a significant role. ABT aims to be a partner in sustainability! promoting sustainable construction in our consultancy services. ABT is well aware of the consequences of CO2 emissions on our climate. Our organisation's contribution to CO2 emissions (the so-called CO2 footprint) is 381 tonnes for 2015. The target for 2015 was to cut a total of 0.64 tonnes in CO2 by comparison with the 2012 reference year. No cut was in fact achieved. The target for 2015 was to cut 0.285 tonne by comparison with 2014. No cut was in fact achieved. The target for 2015 was to cut 34.7 tonnes. A CO2 cut of 49.7 tonnes was in fact achieved. 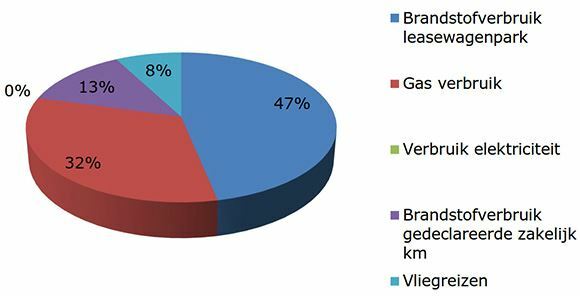 Scope 3: ABT is aiming to have cut total CO2 emissions for residential and work transport in 2015 by 0.05% per FTE by comparison with the base year of 2012. The reduction by comparison with the 2012 reference year is 0.28% per FTE. A greater reduction has been achieved than was aimed for. ABT aims to cut CO2 emissions over the years ahead by optimising design. Improving software (optimising knot geometry and algorithm) and working out the ABT framework; with the result that specific software can be used in a broader and more project-focused way. Ranking the Projects - a structural tool to allow CO2 to be measured for each Environmental Impact Monitor project of structures for sustainable design. By using these tools, ABT has more than achieved its aim for ‘design optimisation’ chain analysis. Below there is a selection of the measures that will have to be taken in 2015 and 2016 and the following years in order to reduce CO2 (by comparison with the 2012 base year). • Renewing the regulating technology for systems at ABT Delft. Electricity and gas can be saved by being able to set the systems more accurately. By means of these measures, it is expected that in 2016 the reduction target of 0.187 tonne of CO2/FTE will be achieved by comparison with 2015. On 14 January 2014, ABT was certified for the CO2 performance ladder, securing the certificate for Step 4 on the performance ladder (of the 5 rungs). An achievement we are proud of! The ladder's objective is to make companies aware of the level of their own CO2 emissions and to stimulate them to continue searching for new ways to cut emissions through their operational management and their own projects. ABT takes part in TKI EnerGO. TKI EnerGO has the aim of speeding up innovation in the development and application of energy savings and the generation of sustainable energy in the Dutch built-up environment and boosting the added value to the Dutch economy as far as possible. ABT also takes part in the Annex 66 ‘Definition and Simulation of Occupant Behavior in Buildings’ working group of the International Energy Agency. Using its involvement in these research projects, ABT aims to provide greater added value to its customers with the knowledge acquired. This knowledge is also being translated into solutions that are applicable in practice and linked to BIM models and other software tools.